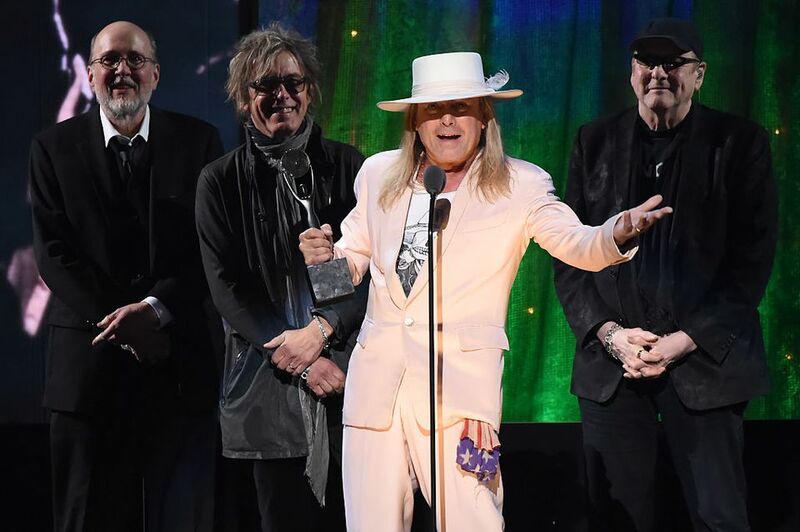 Midwest band Cheap Trick began rocking in the 1970s and hasn’t stopped since. They came out of Illinois, had their big break in Wisconsin, and are now permanently encrusted in Cleveland in the Rock and Roll Hall of Fame. Tom Petersson, who not only is an original band member, but is the “man behind the 12-string bass,” sat down to talk about the Cheap Trick, their Midwest roots, and favorite places to hit when they are here on tour. MF: Congratulations on the Hall of Fame! TP: I’ve been hearing that a lot lately! It’s the one thing that everybody has heard about. Every teacher at (the kids’ school), everybody at the pharmacy, who normally doesn’t talk to us. It’s one of those things that kind of resonates, ‘Oh, hey, cool! MF: Did you expect it this year? It’s not something we grew up with. There was no Hall of Fame when we started. * I don’t know it’s the kind of thing anyone would get into music to inspire to specifically. It’s not anything you have any control over. MF: What did you contribute to the Hall of Fame exhibit in Cleveland? TP: I’ve got a 12 string base in there, one of my original 4 string Gibson Thunderbirds, I think I’ve got a leather jacket -- the coat that I was wearing in the Dream Police video and in the album, on the inside sleeve. MF: How do you feel about coming back to the Midwest to perform? TP: It seems like we are always in the Midwest. I guess I’m living in the south now, south of the Mason-Dixon line (Nashville), but we’re always in the Midwest. MF: Do you still have family here? TP: Yes, my mom and my sister still live in Rockford, Illinois, with her kids and her husband, my nieces. MF: What are your favorite places in the Midwest? TP: One of my favorite restaurants of all time is Karl Ratzsch’s of Milwaukee. It’s a German restaurant and I love that place. There are so few real German restaurants in the U.S., it’s unbelievable. It seems to me that it’s… it’s kind of like Grandma homestyle, where it all originated sort of. You just don’t see German restaurants – you do see places that have bratwurst and stuff like that – the real authentic with roulade and sauerbraten and all that. MF: And, the giant pretzel. I had some when I was at Summerfest last year. TP: Yes, they have Mader’s there too, which is really good. Two in the same city within walking distance. I like the Brat stop in Kenosha. In Chicago, I like Twin Anchors in Old Town. I haven’t been there for years. I always go to Hugo’s Frog Bar in the city. It’s down on Rush and Oak. Carmine’s I go to a lot for Italian. Garrett’s Popcorn, of course. I love Mickey’s Diner in St. Paul. It’s excellent. I love Angel Food Bakery in Minneapolis. That’s great. They have great stuff. MF: How about Chicago pizza? TP: I like Pete’s Pizza. That’s a good one. MF: Let’s get back to Cheap Trick… way back. When did you know it was time to hit the world and leave the Midwest. TP: You had to get a record deal. The major deals were signed out of New York City or Los Angeles so eventually we had to go and somehow figure out how to build a following and it never really happened. We’d play and play, then we’d save our money and drive to Los Angeles and play a few shows at the Starwood in Los Angeles and try to get people to come see us when no one had ever heard of us. Honestly, nothing ever came of it. We didn’t have a deal when we just happened to be playing at the Sunset Bowl in Waukesha, Wisconsin. It was a bowling alley during Christmas time. Producer Jack Douglas, who ended up producing our first album – he was the biggest rock producer at that time, he had done Aerosmith and all sorts of people, he was huge – his in laws lived there and he was there for Christmas. He came to see us at the bowling alley and he signed on as our producer. The minute the record label heard that, it got into a bidding war. Up until that point we were persona not gratis, but overnight we were brilliant (laughter). MF: You left the band right after that (80-87). What brought you back? TP: I came back in ’87 and we did the Lap of Luxury record and we had our first and only number one hit single, ‘The Flame.’ That was good timing (laughs). It (that song) really had nothing to do with my specifically, but it was good luck. Cheap Trick is like family to me. Rick, Rick Nielson, and I worked together since ’68. We went to London together in 1968 and we started a band in ’69. We started doing all original material from that point on. If we were every going to get anywhere except as a cover band, we had to do original material, which meant we wouldn’t get much work at all. All they wanted was people who did cover songs that hit top 40. So, anyone who made any money had to do that, doing disco songs, or whatever was on the radio – Abba, or whatever it was. We didn’t do that. We just mashed our way through and kept going and eventually built up a strong following in the Midwest. Chicago, Milwaukee, and Madison were really big for us, but it still didn’t help us get a record deal. Luckily we were playing in Wisconsin. MF: One of the reasons for your unusual sound was the 12-string bass, which you are the “man behind.” How did that come about? TP: At first, all I had was a Gibson Thunderbird from the early 60s. It really was an extension of that sound. I got my first 12-string bass in 1977, when I finally convinced a new guitar company, Hamer Guitars (of Wilmette, Illinois), to make me one. That’s when it started. We were on tour with Kiss, and they showed up with the bass in the middle of the tour. I plugged it in, loved it, and never turned back. The idea was to have an instrument that had a huge sound – 12 strings. It filled out the sound and made us sound a lot bigger than it would have been with just four people playing. It’s an orchestrated thing and it just kind of suited my style. Ever since then, that’s really all I use live. I love guitars and I also love looking around the Midwest for vintage instruments. MF: What is your favorite Cheap Trick song? TP: Well, that’s like saying, ‘what’s your favorite song of all time?’ It’s normally something we’ve just done. Anything that is the newest we gravitate too, not because it’s the best, because it’s the newest. Who can say what the best song of all time? I love the new single, ‘When I wake up tomorrow,’ on our new record, Bang Zoom, Crazy Hello. It’s so cool because it’s Cheap Trick, but it’s got this Bowie thing going on. It’s really coincidentally – he died after we recorded this song. I think it’s great. MF: Tell me a little about Rock Your Speech? TP: Rock Your Speech is a music project my wife and I started. Our son, who is now nine, Liam, is autistic. We wanted to put music together that had simple lyric content but phrases you could use. Parents could use it as speech therapy. It isn’t like little kiddy music, like “Wheels on the Bus.” It’s music that anyone can listen to and like, myself included. I can play it for my peers. *The first inductees to the Rock and Roll Hall of Fame were in 1986.